This is the second half of my trip to Cripple Creek, Colorado, over the Labor Day weekend. 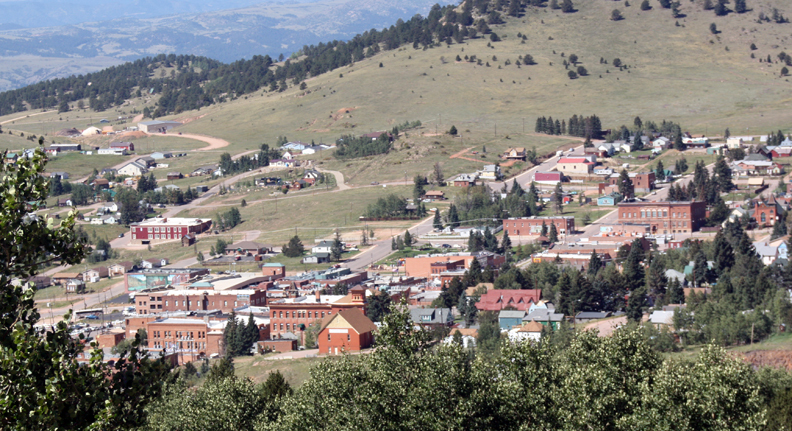 As I described in my last post, we traveled to Cripple Creek on Friday, Sept. 4, 2010 and arrived late at night. 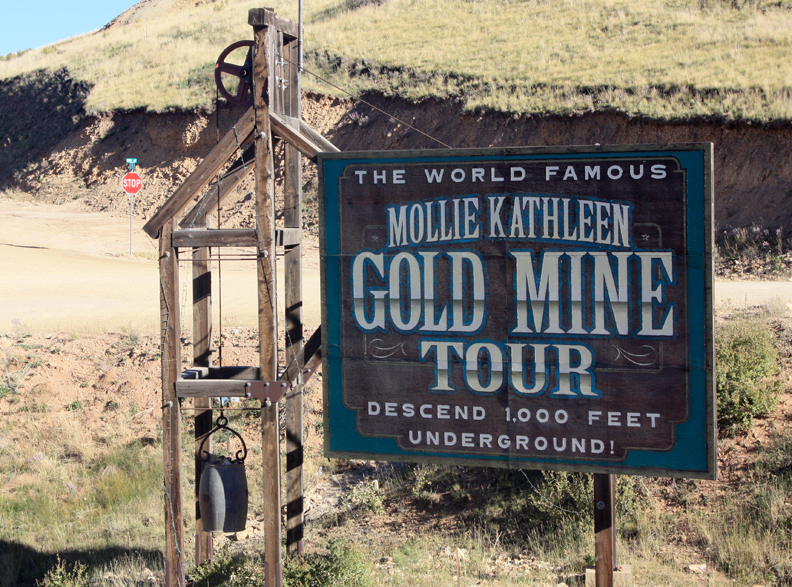 The next day, I started out by taking a guided tour of the Mollie Kathleen gold mine, then visited the Cripple Creek Heritage Center right across the road, taking photos of all the displays. They even had a scale model of the Mollie Kathleen. Now for the rest of our visit: After taking some panoramic video shots of the town from the mine dump behind the heritage center, I drove back down Hwy 67 to the town. 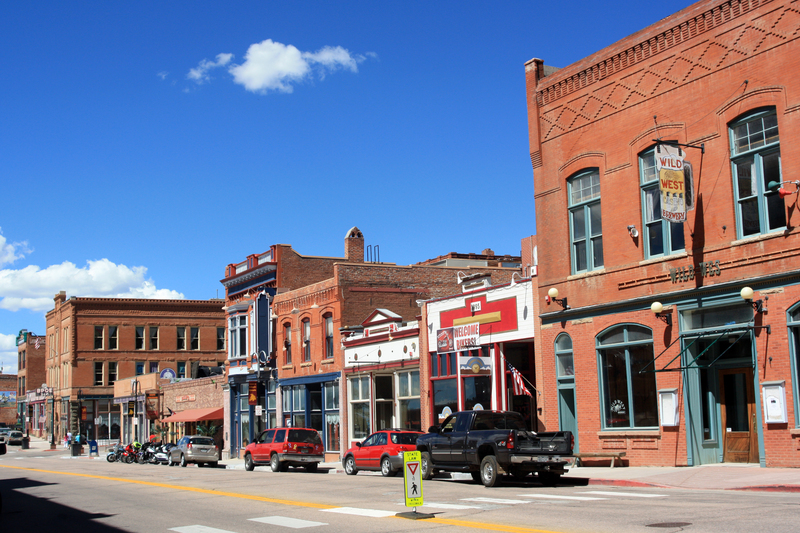 I was to meet my wife, ‘Becca, and our two children at 12:30 at the Cripple Creek District Historic Center at the east end of Bennett Ave. (the main street of town). I was a bit early, so I wandered around and took some photos and video of downtown, then ate lunch with my family. I had wanted to visit the Historic Center (a man at the mine told me it was worth visiting both museums) but didn’t want my family having to wait for me, so we decided instead to take the narrow gauge railroad tour. We were almost late for the train, and in the hurry my son William fell down and skinned his knee in the parking lot, so we were trying to get him bandaged up (fortunately we brought a first aid kit in the diaper bag) while the train pulled away. The loud train whistle frightened William some more, and I’m afraid the whole experience wasn’t very great for him or my wife, who had to hold him most of the way. My other son, Jonathan, was having the time of his life, pointing out all the rocks to me (at three he’s already a budding geologist). I tried to videotape the whole thing and take a few photos as well. The train headed south along the mountain grade, over some old tressles and fills, past many old mine workings, to a point about half way to Victor at the abandoned town of Anaconda. 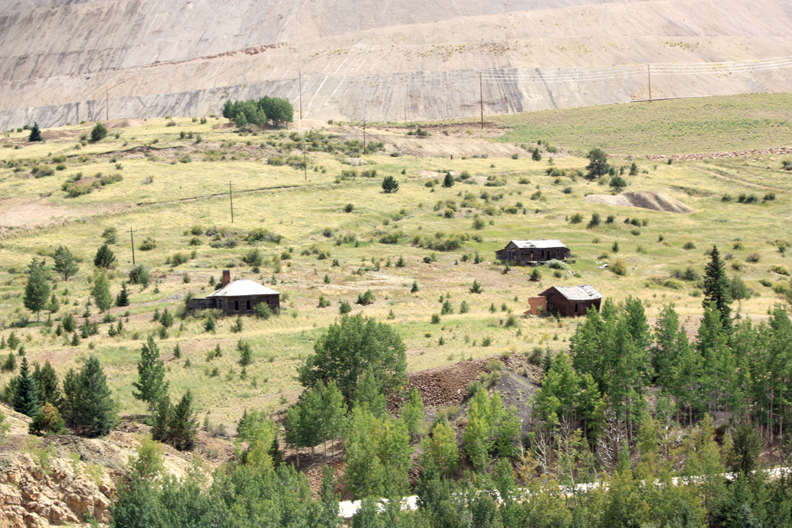 It was quite interesting to see the old mine shacks lower on the hillside and the new terraces and trucks working the higher hillsides for the Cripple Creek and Victor gold mine. On the way back we paused on a siding to let the next train pass, and the engineer pointed out the remains of Crazy Bob Womack’s cabin in Poverty Gulch, who was the first to discover gold in the district in 1890. We had a good view of Cripple Creek and Myer Ave., which was the notorious part of town. We had to leave for Denver by 3:00, so we had just enough time to drive out to Victor and snap a few photos. There are many headframes on the hillsides around town, including those of Stratton’s Independence Mine and the Portland, which he had a share of. 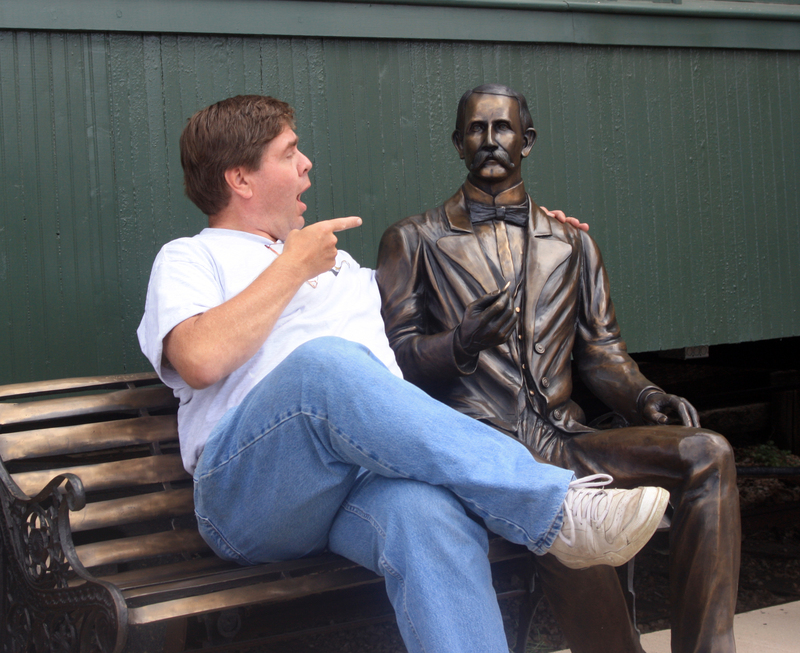 As we left, I had to take one more photo of myself seated on this bench with Stratton himself (well, at least a bronze replica of him). Winfield Scott Stratton was the first big millionaire of the district, discovering his gold telluride deposit on July 4th, 1891. He had searched unsuccessfully for silver and gold for the previous 17 years, working as a carpenter during the winters to finance his summer prospecting expeditions. He had even built a sign for H. A W. Tabor in Leadville for his opera house while he was prospecting there. He finally decided he needed more education and took courses in mineralogy at the new Colorado School of Mines. In 1891, he scoured much of the Cripple Creek area and found nothing. On the evening of July 3, 1891, he had a dream in which he imagined going back to a granite ledge he had already passed over. The next day, upon revisiting the site, he noticed signs of gold telluride ore, and discovered rich veins in some boulders that had fallen off the main face of the ledge. He staked a claim and named it the Independence, which he eventually sold for $11 million to a group of British businessmen, the highest amount paid to date for any mine, and a large fortune at the time. But Stratton wasn’t one to blow all of his money; he’d learned from the example of Tabor, who was now ruined because of the Silver Panic of 1893. Eventually Tabor came to Stratton looking to sell some mine stock to help pay his debts. Stratton paid him $50,000 for the stock, but never bothered to record the sale at the mine office. Stratton eventually bought a house in Colorado Springs that he himself had built years before and lived there the rest of his life. I had read a biography about him a couple of years ago called Midas of the Rockies by Frank Waters (1937) and now I’ve finally visited the sites he helped to make famous. There is still much I would like to do and see here. I would like to hike some of the paths in Victor, take the tour of the open pit mine, and view the whole valley from the Eagles overlook. But that will have to wait for another trip. At least I have gathered enough footage and photos to make a great video of the Cripple Creek mining district. Over Labor Day weekend I traveled with my family to Denver to visit my brother-in-law’s family. 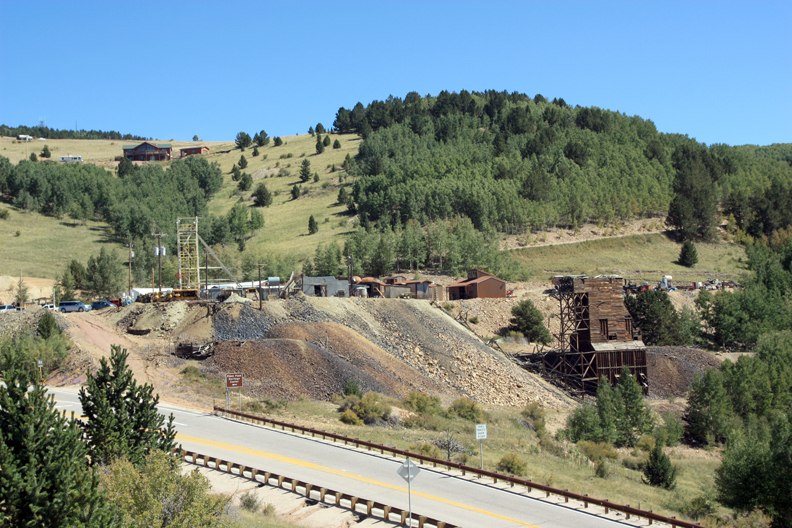 On the way, we stopped off at Cripple Creek, Colorado, to tour the gold mining district. I’ve been near there twice before but never took the chance to stop and visit, so this time I determined to get there no matter what. Since we left after my classes were over on Friday at 2:45 p.m., with occasional stops for food and stretching, we didn’t get into our motel until 2:30 a.m.
On Saturday I got up early and drove a couple of miles out of town on Highway 67 to the Mollie Kathleen gold mine. I arrived about 8:50 and the first tour was at 9:30, so I took the time to take photos around the mine site of the old equipment and original headframes. One person there told me a bear had walked through the site just ten minutes before I arrived. At 9:30 we donned hard hats and were loaded tightly into the double-decker man skip to travel 1000 feet down to the bottom level of the mine. Jim Smith was our tour guide, and of all the tours I’ve taken of mines around the country, this was one of the best. Not only did he explain how the equipment was used, he actually demonstrated it (it is still in working order). 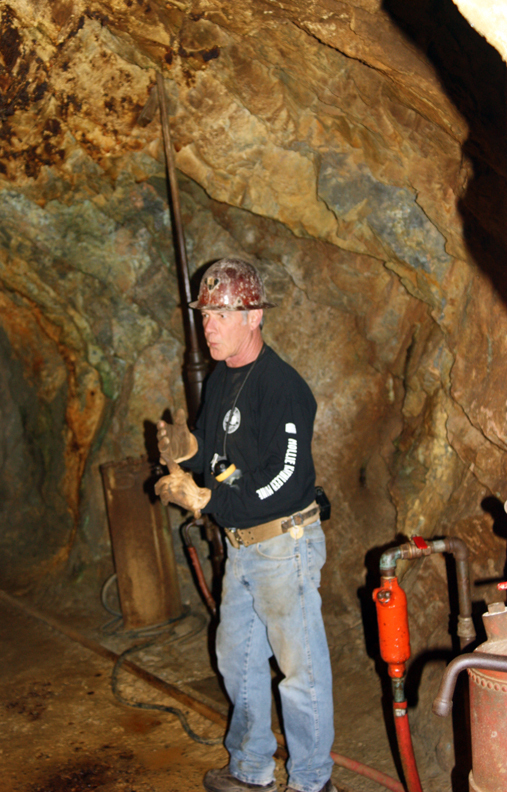 We saw how hydraulic drills, stope drills, muckers, bucket dumps, and other types of equipment were used by the miners. The tour lasted about an hour. I videotaped the whole thing, but wasn’t able to take many photos because we moved through the tour fast enough that I couldn’t use both cameras at once. 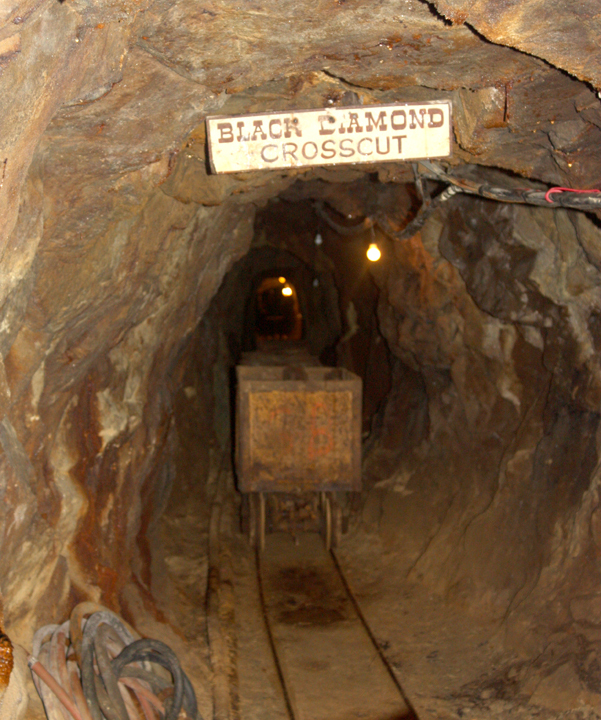 Jim described how miners would discover a gold vein or deposit, and shafts and crosscuts would be dug into the bottom of the deposit so that it could be stoped upward (following the deposit as it twists through the rock), standing on planks using a stoping drill that could jam and flip you off the plank at any time. Some deposits were found filling cavities called vugs, where the gold would replace the granite rock and form rich veins. The normal grade of ore assayed at about $2 of gold per ore car; some of these vug deposits, such as the one in the Cresson Mine, assayed out at over $4000 per car. Miners were paid $3 per day at that time (the same as miners in the Tintic District in Utah) and it was common for miners to “high grade,” or smuggle rich ore samples out in the false bottoms of their lunch pails. Mary Catherine (Mollie Kathleen) Gortner discovered the mine in 1891 shortly after Bob Womack and Winfield Scott Stratton had discovered their gold lodes. She was visiting her son, who was prospecting in the camp, and walked up Poverty Gulch to where he was working. As she sat down to rest, her foot kicked a rock that looked like promising gold float, and she followed the rock to its source (which had already been missed by numerous miners) and memorized its location – she was too afraid of someone jumping her claim to even mark it. When the rocks she hid in her dress assayed out as rich gold ore, she returned and staked a claim as one of the few women mine owners in the district. Since then, the Mollie Kathleen has been in more-or-less continuous operation as a producing gold mine; the Lanning family that owns it now still goes in during the winter to mine out veins. They can make a small profit, with gold at over $1200 per ounce now (the main problem for the gold mines in the district isn’t the lack of gold, but the lack of a local mill to process it). But the main source of income now is from the mine tours. 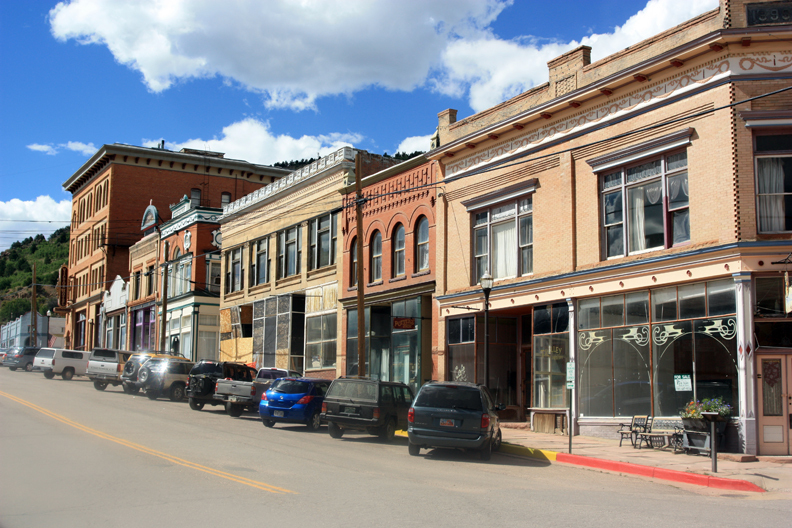 After the tour I visited the Cripple Creek Heritage Center across the street and took some panoramic videos of the town, as the view was great. 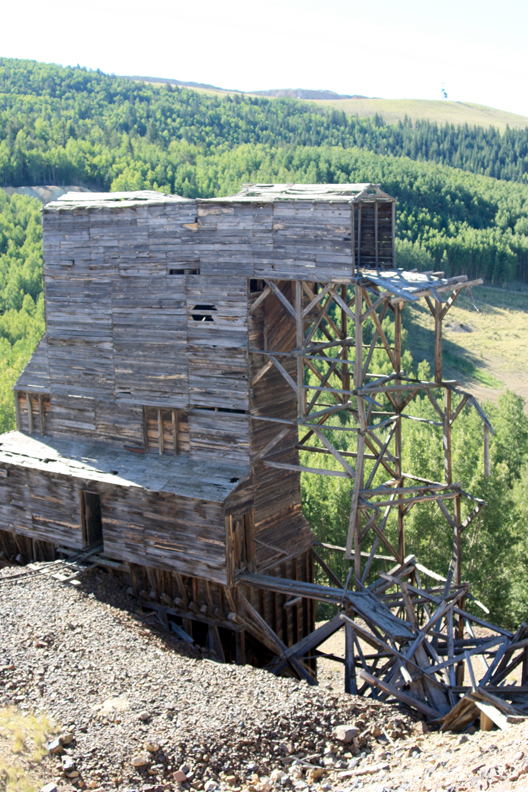 There were headframes on most every hill and holes everywhere where prospectors had tried and failed to find gold. At the top of the major hills was a huge continuous tailings pile from the Cripple Creek and Victor Gold Mine, a large open pit/surface mining operation that is still operating. They are concentrating the ore through leaching the tailings piles, and it is interesting to see this modern mining operation superimposed on the older, historic mines. 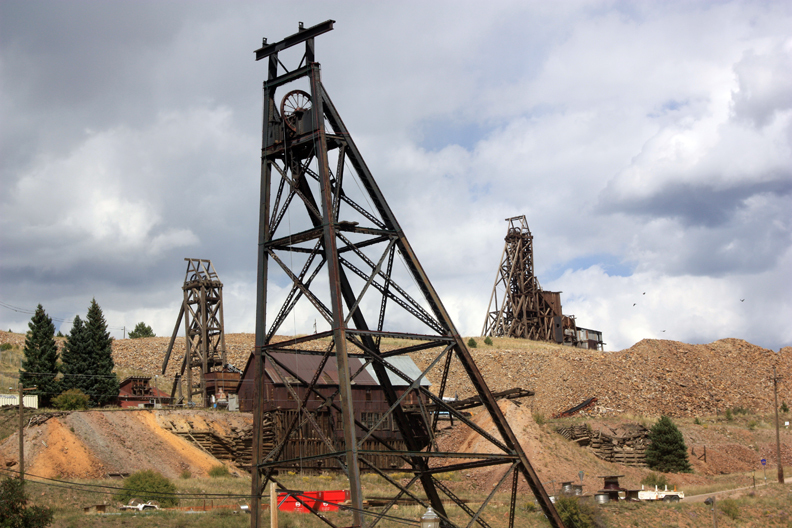 Next post, I’ll describe the towns of Cripple Creek and Victor and some of the mines in the area. 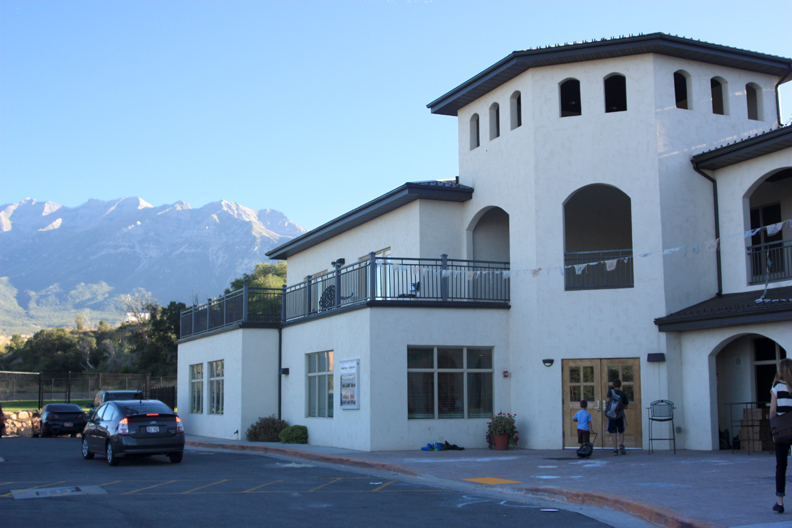 The past month has been crazy busy as I’ve prepared for my new teaching job at Walden School of Liberal Arts in Provo, Utah. I had intended on writing at least six blog posts in August and interviewing at least one person, but didn’t do any of it; instead, I’ve been writing curricula, lesson plans, preparing my classroom, and going on a four-day backpacking trip with my students to the high Uintah Mountains, up past Mirror Lake to Naturalist Basin. My legs are still recovering. Now this week has begun our first week of classes: I am teaching two sections of Honors Chemistry and one section of Astronomy on Mondays, Wednesday, and Fridays and one section of Computer Technology and one of Multimedia on Tuesdays and Thursdays. I’ll probably also pick up a Video Production class afterschool as well on those days. So far we are three days into the school year and things are going well. 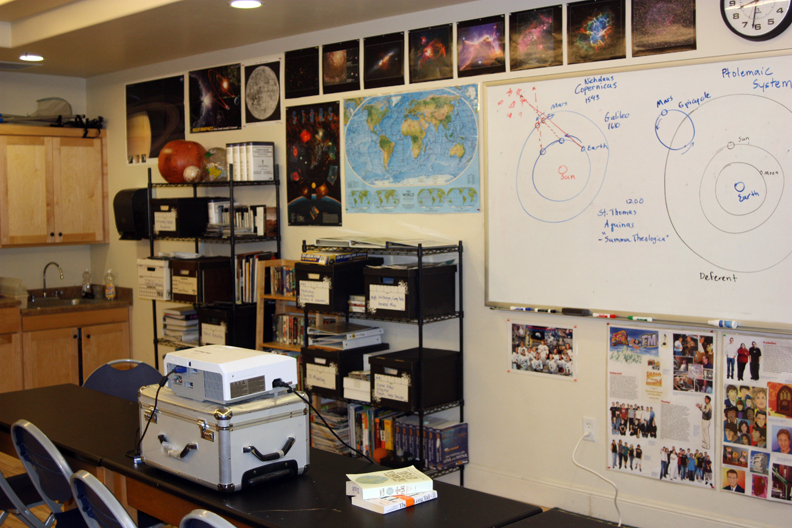 During the first term, each student will select a topic from one of four categories: elements, materials, energy processes, or the history of chemistry. They will conduct background research and develop an extensive set of notes with references, which they will condense into some form of print media, such as a poster, newsletter, brochure, etc. which they will convert to .pdf format. They will act as guest hosts of this blog, each one taking a turn to write a post entry about their topic and attaching their .pdf file to it for all to see. During second term, they will come up with some sort of demonstration that relates in some way to their chosen topic, and practice it in class, then on a Friday in November we’ll take the whole class downstairs to the elementary classrooms (Walden School is a K-12 Montessori school) and present their demonstrations to the students, as well as handing out a simple worksheet or activity the students can take home. The chemistry students will also present their demonstrations to each other just before winter break and receive feedback. 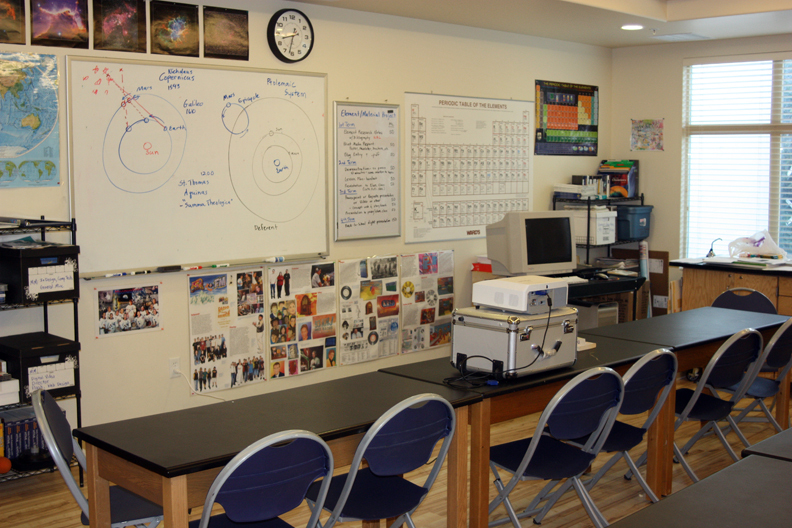 During third term, the chemistry students will add a Powerpoint or Keynote presentation or a video to their topic, which will be presented to their peers and added to this blog site. They will also present again to a different elementary class. During fourth term, they will present their demonstration, Powerpoint, video, etc. to the public and their parents at a Back-to-School Science Night at the end of April or start of May. We’ll videotape the proceedings and add the videos to this blog as well. This may seem like a huge project (and it is) but I’ve done all of this before when I’ve taught chemistry at Juab High School in Nephi (except for the media elements – that comes from MATC). Those students who wish can utilize the footage and photos I’ve already gotten for the Elements Unearthed project to do their element or material reports. They can also compete in the Chemical Heritage Foundation’s “It’s Elemental” video competition. My multimedia students will help on the longer videos I’m creating for this blog, YouTube, and iTunes (we’ll set up the iTunes account in our Computer Tech. course). So you see, I have landed in an ideal situation for classes that I love to teach coupled with a great group of students and an environment that works perfectly for this project. I’m very excited to see what will come out of it. At the very least, this blog should be quite a lively place.